Bruce Nauman’s Contrapposto Studies, I through VII (2015–16) is part of his ongoing search for capaciousness in the particular. This seven-part video installation is split between two galleries at the Philadelphia Museum of Art and is kin to his iconic 1968 single-channel video Walk with Contrapposto, owned by the museum and on display in an adjacent room. In Walk, a monitor presents a young Nauman strutting along a narrow corridor with exaggerated shifts of weight, simulating the contrapposto pose of Classical sculpture. 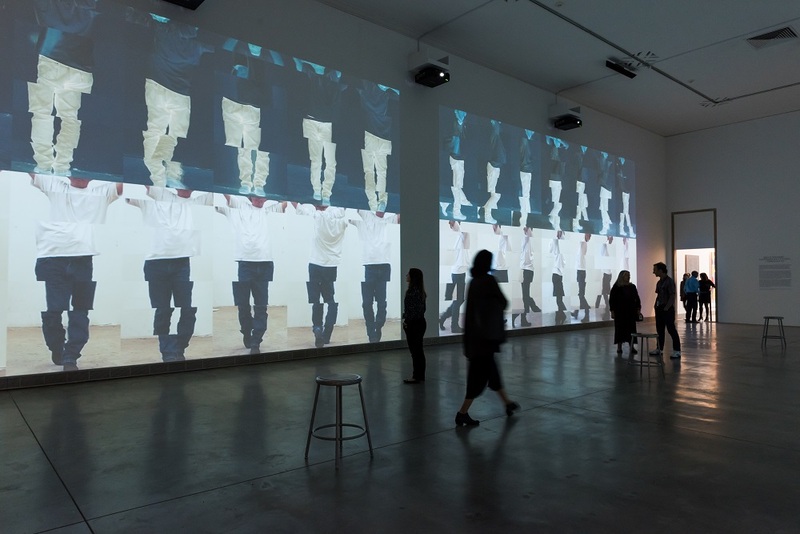 Each of the new projections shows Nauman performing his walk against a white wall and comprises multiple video segments organized in horizontal bands. The segments are digitally stitched together imperfectly so that adjacent parts do not join neatly. Though the body is more or less contiguous, in some projections it appears especially faceted. Like Walk, Contrapposto Studies trains a camera on Nauman, yet the work’s particular significance lies in how the same action performed by the same body takes on different connotations at different times. Contrapposto Studies focuses on the imprecision of repetition, especially if that repetition attempts to reenact one’s former actions. Perhaps the most prominent demonstration of this occurs by way of Nauman’s aging body, which he presents to the viewer in a white T-shirt ridden with small holes—a wry counterpoint to the pristine one he wore in Walk. The artist’s tightly wound and slithering gait also has changed. He appears to roll his weight slowly between his feet and lands haltingly in contrapposto at the end of each step, occasionally faltering. In the more faceted projections, the body’s uneven tread and the disjointedness of the stitched video fragments make for a double destabilization. If Walk swipes at the artifice of contrapposto, Contrapposto Studies thwarts contrapposto’s timeless idealism by manifesting the stance in Nauman’s imperfect figure. The installation elegantly confounds the passage of time. Because the views of Nauman are composites of several shots and asynchronously looped, the resulting images are unmoored from any specific moment. This sense is corroborated by the way the camera follows Nauman in each segment, zooming in and out and tracking his movement left and right, always keeping his body centered in the frame. Since the videos repeat, the artist never seems to arrive anywhere. Instead, he hovers indefinitely before our eyes, perpetually deferring conclusion.